By Daniel Horowitz--Today, Thursday, May 23, the first team of four professional IsraAID workers are expected to arrive on the ground in Moore, Oklahoma, where earlier this week, a violent tornado unleashed its fury, killing 24 people, including 10 children. In the wake of Monday’s devastating tornado, United Jewish Appeal of Greater Toronto has established the UJA Oklahoma City Tornado Relief Fund. The fund will meet needs identified by the Jewish Federation of Greater Oklahoma City, and to support the relief efforts of IsraAID. IsraAID: The Israel Forum for International Humanitarian Aid, is an Israeli-based humanitarian organization that responds to emergencies all over the world, and has partnered with UJA of Greater Toronto regularly to help victims of natural disasters since the December 2005 Tsunami in Southeast Asia. The tornado destroyed countless homes and reduced one elementary school almost entirely to rubble. “The IsraAID team will meet their counterparts in the local community as well as with government officials upon their arrival in Oklahoma," said Shachar Zahavi, Executive Director, IsraAID. "As was the case with Hurricane Sandy, our focus will be to help pack relief items, help gutting houses, and discuss the development of a trauma program." There are approximately 5,000 Jews in the Greater Oklahoma City area. "Still shaken from the images of the deadly monster tornado that ravaged Moore, Oklahoma, we are all still trying to catch our breath," said Edie Roodman, Executive Director, Jewish Federation of Oklahoma City. "Our spirits have been lifted by the hundreds of caring phone calls, dozens and dozens of compassionate emails, and countless concerned texts. So many have asked whether members of our Jewish community were directly affected, how to help, or the best ways to donate, reminding us again that we are each responsible for one another, averim zeh b'zeh." "As a parent, to learn that ten children - including two infants - just four and seven months old - are among those who perished in Monday's fierce twister, it's especially hard to accept this unspeakable tragedy," said Ted Sokolsky, President & CEO, UJA Federation of Greater Toronto. "On behalf of UJA Federation of Greater Toronto, our prayers are with the people of Oklahoma City as they begin the daunting task of rebuilding their lives and making the community whole again." 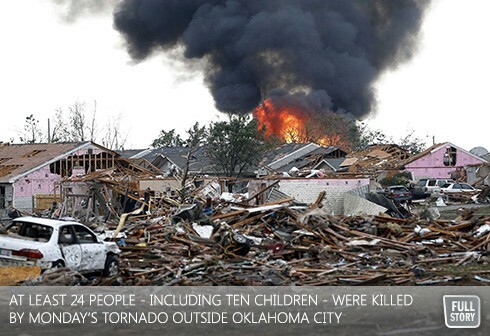 To contribute to UJA's Oklahoma City Tornado Relief Fund, please visit ujadonations.com/OKC or call 416-631-5705.